NPD released the March 2008 video game sales data this past week, and God of War Chains of Olympus and Final Fantasy VII Crisis Core were the 5th and 6th best selling games during the month. We showed earlier that new releases raise the used prices of other games in the series, but this is a perfect chance to look at the price changes for old games that are out-of-print vs games that are still in-print. Both God of War and God of War II for Playstation 2 are still being printed by Sony, but Final Fantasy VII for Playstation 1 is no longer in print. Do the prices of out-of-print games increase more with a new release compared to in-print games? God of War Chains of Olympus was released on PSP on March 4th. In general you can expect some number of people who played the new game to want to buy one of the older ones. I am sure this happened with God of War, but you wouldn't be able to tell by simply looking at the prices for the original games. God of War's price has stayed very steady in the high $8 range for the last three months. 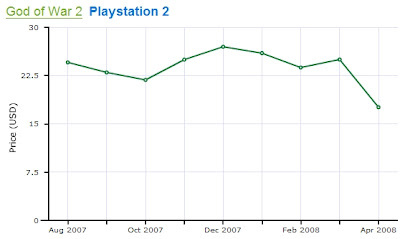 God of War II's price dropped significantly during April because the game was added to the PS2 Greatest Hits line so the new price dropped to $19.99. This lowered the used price of the game too. These charts make it pretty clear that any price increases for God of War series games were damped by the low prices for brand new versions still readily available at retail. People could go buy the games new and didn't have to resort to buying the used versions online. Final Fantasy VII Crisis Core was released March 25th in the US. Anyone wanting to play the original though had to buy the game online because Square Enix no longer sells the game at retail. This caused a huge spike in the price. 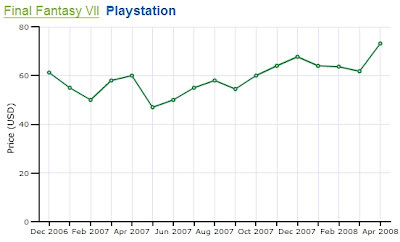 Final Fantasy VII went from an average price of $61.80 in March to $73.16 in April, more than an $11 increase in one month. Its basic Econ 101. 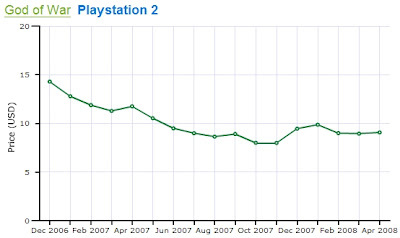 The supply for out-of-print video games can't increase but when the demand increases the prices increase as well. The demand for the in-print games increases too but the supply of games increases as well causing a much smaller (if any) increase in price. If you are planning on buying a sequel video game in the future be sure to replay the games in the series BEFORE the new one. You'll save yourself some money. Toplessrobot.com wrote an article about the 10 best NES games nobody played. I decided to look at how much those games would cost now so people can play these forgotten treasures on their Nintendo consoles. You can pick up quite a few of these games for almost nothing. If you still have your NES these would be some great games to buy to get some cheap entertainment. Others are pretty expensive now. $20-50 is quite a bit for just the cartridge of an old NES game. But I don't think any of these titles have a chance of being released on Virtual Console so if you want to try them out you will have to fork over the money. Earlier this year I posted my predictions for some specific games and what would happen to their prices. This is a follow-up to see how I did so far and why I might have gotten the predictions wrong. February - I predicted Devil May Cry games, and Devil May Cry 3 specifically, would increase in price because DMC 4 was released in February. All three Playstation 2 Devil May Cry games increased in price from January to February. March - I predicted that Super Smash Bros on N64 would drop in price in March because the price was high in January. The timing was wrong on this prediction though. Smash Bros on Nintendo 64 dropped almost $3 from January to February, but increased about $1.50 in March. Since my prediction was for a price decrease in March, I guess I am officially wrong. So far I got the February prediction right and March wrong. I'm shooting 50% so far. It looks like my April prediction of Grand Theft Auto price increases is going to be correct (GTA San Andreas for Xbox and GTA Trilogy for Xbox have increased quite a bit), so hopefully I will have a 66% average next month. I need to start off with a disclaimer. I am not a tax professional. This article is based upon many hours of research I have done into the tax code. But, taxes and tax law are not my main area of expertise. You should consult with a tax professional before using any of the information presented in this article. Your video game collection could save you money on your taxes. If the IRS considers you a video game investor instead of just a collector, you can deduct expenses related to your collection and lower your tax bill this April 15. So what does the IRS think you are? A video game collector or investor? Do you keep good records? Investors keep track of what they buy and sell. Do you consult outside advisors? Investors buy magazines and books from experts and ask others for advice. How much time or effort do you expend? Investors generally spend more time than collectors researching, maintaining, and tracking their video games. Can the assets appreciate? You can't be an investor if you have no chance of making money. Have you made money from this activity before? Investors will probably have made money at some point previously in the same manor. How much fun do you get from your purchases? Investors buy more for monetary value than personal pleasure. None of these factors determines your status by itself. The IRS looks at all of them and decides what you are. If you look like an investor, smell like an investor, and sound like an investor, you must be an investor. The biggest difference between a video game investor and a video game collector tax-wise is the investor can deduct expenses related to their video game purchases (IRS Section 212), while video game collectors cannot (IRS Section 262). An investor can write off video game magazine subscriptions, storage costs, insurance, cleaning costs, and other expenses related to their investment. 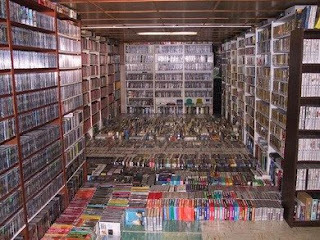 Below is a list of do's and don'ts for video game collectors and investors. This is the single biggest factor in determining if you are a collector or investor. Investors keep good records of what they bought, when they bought it, and how much they paid for it. Collectors don't. Creating a simple Excel spreadsheet with all this information and keeping it up-to-date is not that difficult but is a must. You will need to know how much your video games are worth if you want to be considered an investor. Buying a video game value book or looking up your video game prices online will work. 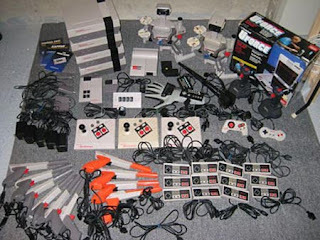 It can be nice to brag and say, "My video game collection is worth $5,000" and know its true. Reading video game publications, subscribing to video game collecting magazines, or buying video game collecting books help show the IRS that you are a video game investor. You are spending time and money trying to figure out what to buy and know the industry better. Plus you can write off any of these expenses on your tax return. They are investment expenses. You can deduct a portion of your rent and heat as investment expenses. Let's say your house is 2,000 sq. ft. and your storage space for the games is 1,000 sq. ft. (I wish I had a collection that big). You can write off 50 percent of your rent and heat because they are expenses needed to house your investment. If you keep all your video games intermixed, collectibles with personal games, you will not be able to deduct storage expenses. I'm not saying you can't buy any new games. You can still buy new video games for your personal use, but do not consider those games as part of your investments. Video games lose value once you open them, much like cars drop in price once you drive them off the lot. That is a purchase for personal use, not an investment and the IRS knows you wouldn't purposefully make an investment lose value. That would be like buying the Mona Lisa and drawing a mustache on her face. Be careful about booking trips to E3 and the Tokyo Game Convention and then writing them off as investment expenses. For most video game collectors they probably don't report enough income for the investments to make this acceptable. The IRS has ruled in the past that if your business expenses are a lot more than your income, you are probably not an investor. Again, this is fine to do but you are not an investor. If your records show that you consistently buy video games and sell them two weeks later for no profit, the IRS will probably assume you are playing them and then selling them. In that case you are buying for pleasure. You cannot deduct expenses related to personal pursuits. If your gut feeling is you shouldn't be considered a video game investor then don't deduct any expenses. There was some discussion in the comments section about taxes on the income you make from selling your video games so I wanted to clarify a few points and post one more major benefit to being classified as a video game investor. "only capital losses on investment or business property are deductible"
If you are classified as a video game investor, you can deduct the losses from your purchases. Here's an example: An investor and a collector both buy Lunar Silver Star for $50 and Earthbound for $100. A year later they both sell. Lunar sells for $70 and Earthbound sells for $80. Both the investor and the collector report $20 in capital gains on their taxes for Lunar. But only the investor can report the $20 loss Earthbound.